It looks like Best Buy didn't clear its stock of 32GB iPhone 4 last weekend as the buy one 32 GB iPhone 4 and get one free offer is back. 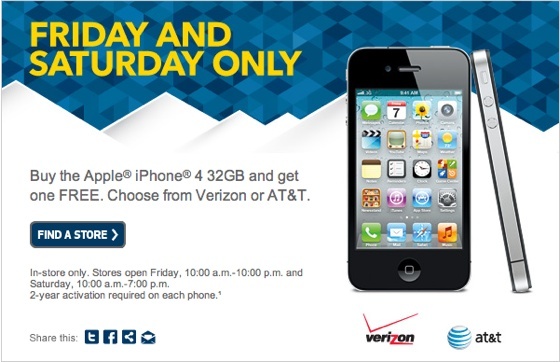 Best Buy is giving away a free 32 GB iPhone 4 if you buy one today or tomorrow. The offer is available only in store with a 2-year contract. Best Buy stores are open from 10:00 am to 10:00 pm today and from 10:00 am to 7:00 pm tomorrow. Even though the rest of your article is very clear, the first line reads:"It looks like Best Buy didn't clear its stock of 32GB iPhone 4s last weekend "You may want to take the "s" off the 4, or you will get someone ranting here about how you mislead them.... yes there are people that stupid here, that would be at best buy tonight yelling about how your website said the 4s was buy one get one free.... *sigh*anywho .. Happy new year, Thanks for all your handwork on keeping us up to date on the latest news. Done!Thanks and Happy new year to you as well! Does anyone have a link to the webpage? so I can find out what stores are offering it. and who will pay for the monthly bills, lol. I was so excited to get this deal and went to Best Buy store for this deal near Bellingham WA.I was informed by Best buy cell phone sale agent that neither they have any iphones in stock, nor they will offer any ran check on it. Well, it really sounds like that Best buy was scamming their customers and lowering them to come to their stores to find out that Iphone is sold out and to try some other phone that you don't want to purchase. That was a Scam and a marketing techtic to bring people in for Iphone and then sell them something else. I will not buy anything from Best Buy anything ever again.